With free light continental breakfast an outdoor pool a hot tub and an on-site business center the Vagabond Inn San Jose Airport is a wallet-friendly retreat close to many of San Jose's favorite attractions. Attractive landscaping complete with towering palm trees sets the stage for your stay at the Vagabond Inn. With 76 rooms on two floors this motel is pet-friendly (although a fee may be charged) and offers both smoking and non-smoking rooms. Complimentary tea coffee and popcorn are available 24/7 in the lobby. Rooms include free local phone calls and microwaves and you can request a mini-fridge for an extra fee. The motel also provides guest laundry facilities. Complimentary Wi-Fi is available in the rooms which all face exterior corridors. 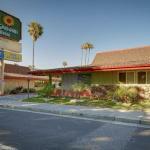 Located just two miles from San Jose International Airport the Vagabond Inn is about three miles from downtown San Jose. It's right by the light rail at Gish Station providing easy public transport to the rest of the city. Santa Clara University is just on the other side of the airport three miles from the hotel.